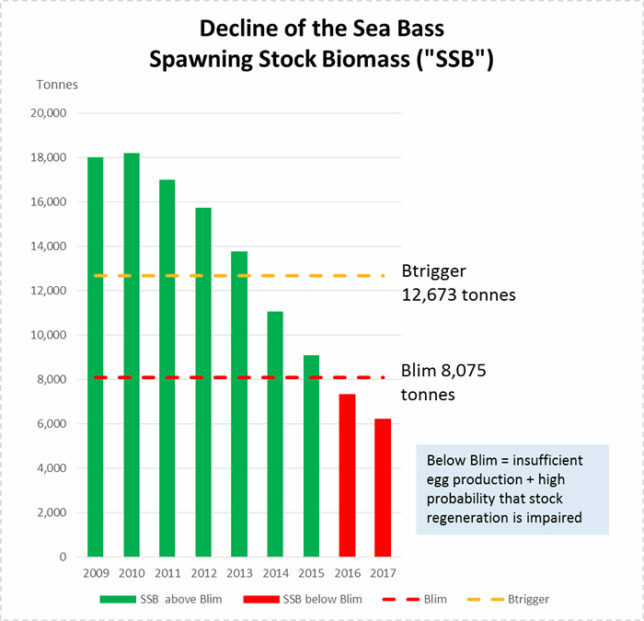 In June 2013, the scientists at the International Council for the Exploration of the Sea (“ICES”) produced their first ever analytical assessment of the bass fishery and noted that the rate of mortality due to commercial fishing was unsustainably high and that the SSB (the Spawning Stock Biomass) had been declining since 2005. Since 2013 the bass stock has declined at an alarming rate. The scientists say that management measures need to be taken once the SSB falls below 12,673 tonnes and that once the SSB falls below 8,075 tonnes there is a high probability that the stock’s ability to regenerate itself will be impaired due to insufficient egg production. Sadly, the current SSB is just now 6,414 tonnes – the EU Fisheries Ministers and the EU Commission failed to act quickly enough. The risk now is that, even if fishing is much reduced, the stock may fail to recover and remain depleted for an extended period. December 2014 was a critical date for bass. Following our lobbying, the UK Fisheries Minister, George Eustice, broke the deadlock on bass management measures by making a unilateral request to the EU Commission for emergency measures to prevent pair trawlers targeting bass spawning aggregations. Pair trawlers, purse seiners and drift netters are completely excluded from the bass fishery. Demersal trawlers and seiners can no longer target bass and are restricted to a by-catch allowance of 1% of total catch per day with a low monthly cap. Fixed netters can no longer target bass and are restricted to a by-catch allowance of 1.2 tonnes per annum. Hook & line fishermen are restricted to 5 tonnes per annum. Minimum Conservation Reference Size is 42cm (a massive improvement on the 2015 Minimum Landing Size of 36cm, but still short of what is needed to protect all bass until they have matured and reproduced at least once). But bass anglers have not been immune from restrictions and at times we have had the rough end of the stick, despite being the most sustainable form of bass fishing and delivering far greater environmental, social and economic benefits than commercial fishing. In 2015, we were restricted to a 3 fish per day bag limit. From 2016 the bag limit was reduced to 1 fish per day for 6 months of the year. And now in 2018, we are trying to overturn proposed legislation that would stop us from taking a bass for the table but would allow commercial fishermen to continue landing and selling bass – a privatisation of the bass fishery. 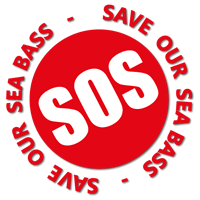 As well as campaigning to save the bass stock, BASS is working on a Long Term Management Plan that would deliver a rich, vibrant and sustainable bass fishery.